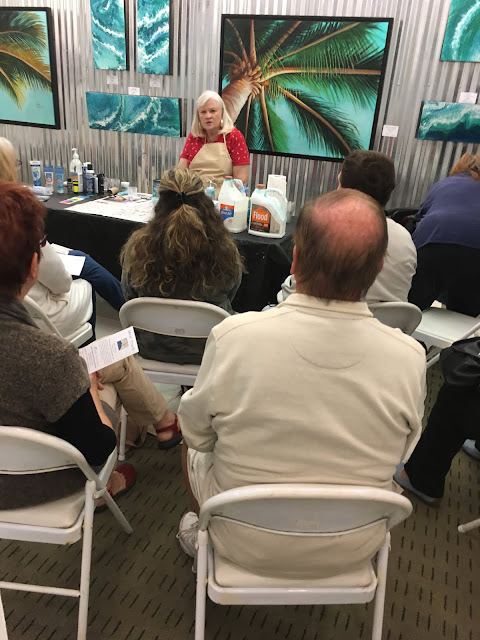 HAVE YOU CONSIDERED ART FAIRS? 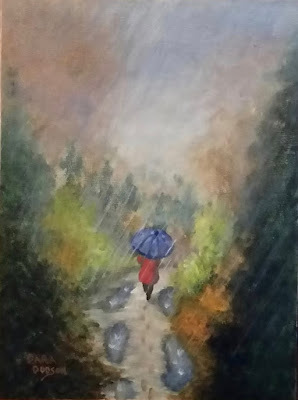 I started by doing smaller art walks held monthly at a nearby town. It didn't require a lot of setup, just a table and some tall folding display racks my son-in-law made for me. There was not a large investment required. It did ok, but I felt it was a lot of work with only a small profit. So, I decided to look for an art fair tent (only white is allowed) and I found a used one on Craigslist for $150. New, they can cost from $350 to over $5000. Then I looked at display wall systems. Again, they start at around $1200 new. So, I went to Pinterest to see if there might be a way to make them. There were directions, but still more than I wanted to pay. I kept looking and I found metal grids on Craigslist (used). There weren't quite enough to fill the tent, so I found a wholesaler in town for the remainder of needed items, including hangers for the paintings. Then I made a sign and ordered a banner thru Vistaprint. All total I had about $600 invested. Next, I ordered a booklet on how to succeed at Art Fairs. I read it through and found I was doing most things correctly. And I was encouraged to know that it takes a little while to get into the groove. I covered my expenses on my first show. Now, any that I do will be profit and I'm very happy about that! There are enough shows around the country that an artist could make it a full-time job if they wanted. Just go to WWW.ZAPPLICATION.ORG and you can find shows all over the country, including dates, locations, costs, applications, requirements: everything you need to know and more. You can also set up notifications according to your interests too. I do only shows close by as we are no longer young and vigorous. But, I have decided to do a local Art Market here in St Augustine that is held twice monthly for 3 hours each. I will not use my full set-up for now, rather I will use a partial set-up at first and see how it goes. A friend has lightweight grids that are freestanding that she lets me use and I have a 6' table and long cloth that hangs to the floor for a professional look. I have taken the display racks my son-in-law made and reworked them to fold accordion style and I will set them across the back of my table so I have a good display area. I will also not use the walls on my tent. That way it looks professional, but still a quick & easy to set-up and break-down. This Art Market is very well supported by the public so I am very excited about doing it. Each vendor must apply and get approval, plus have a tax receipt, but that's normal procedure. If you decide to do something like this, I would recommend going to a few shows first to see how the different artists set up their displays as well as talk to them for any suggestions, etc. They are usually happy to talk to you as long as they are not busy with customers. They have experience and can save you a lot of time and effort. Plus they may share ideas for you to use! I have a photo of my tent set up at the last Art Fair here last spring. 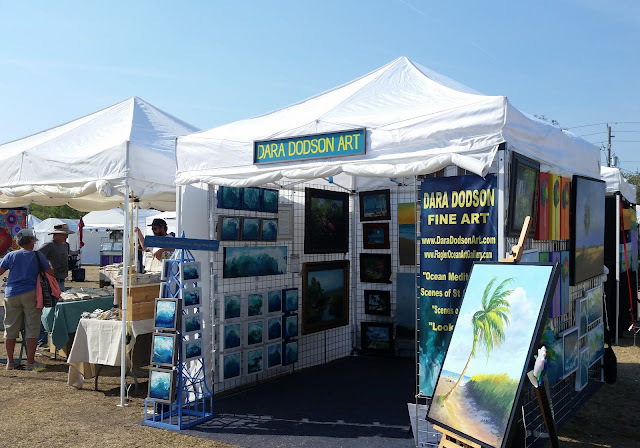 There's an Art Fair in Jacksonville Beach this October 13th & 14th called THE BEACHES ART FEST in which I will participate, and the Art Market is held at the St Augustine Amphitheater on the second and fourth Tuesday of each month from 6 to 9 pm. If you live in the area, please come by! Thanks for looking and see you soon! "THE OLD TOWN ART FAIR"